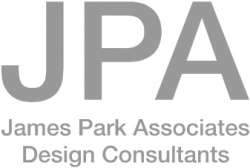 JPA is an award-winning multi-disciplinary design consultancy specialising in architecture, interior design and product design. The company specialises in the design of all areas of the passenger experience from the hotel to the ticket office, check-in desk, airport lounge, the cabin interior and all associated branded items such as uniforms, soft items and tableware. The company has a 30 year track record in delivering innovation and with offices in London and Singapore, JPA’s design teams are able to tackle projects anywhere in the world. JPA has built up an impressive client base and some recent projects include the new Oman Air First and Business Class lounges in Muscat; the new Gulf Air Premium Class lounge in London Heathrow; and the award-winning Singapore Airlines First Class Reception & Check-in at Changi Airport. Hotel projects include the iconic Pierre Hotel in New York, the Taj Mahal Palace & Tower, Mumbai; and the award-winning Taj Exotica & Spa Resorts in the Maldives and Mauritius. 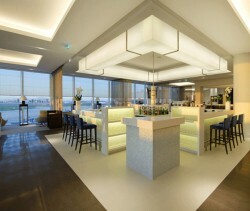 The new lounge covers a floor area of 600 square metres and caters for up to 110 passengers at a time. Facilities include reception, lounge seating, reclining seating, dining area, central feature bar, self-service buffet, business centre, TV & relaxation area, luxury wash rooms, private shower rooms, family rooms and prayer rooms. JPA provided a comprehensive service to Gulf Air from research, concept design, brand management, design development and engineering, materials sourcing, testing and specification and on-site supervision. JPA worked closely with the building contractor and the airport authorities to ensure that safety, security and compliance with regulations were adhered to. The new lounges cover a floor area of 1100square metres and include dining facilities, self-service buffet, quiet rooms, wash and shower rooms, a business centre and a “Chedi” luxury hotel spa with massage rooms. JPA provided a comprehensive service to Oman Air from research, concept design, brand management, design development and engineering, materials sourcing, testing and specification and on-site supervision. JPA worked closely with the building contractor and the airport authorities in Oman to ensure that safety, security and compliance with regulations were adhered to. 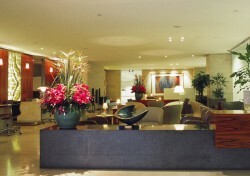 JPA’s first foray into the field of airport lounge design, but JPA’s hospitality experience provided them with a unique perspective and JPA were perfectly placed to answer Singapore Airlines’ brief to achieve a service environment akin to a 5-Star hotel. The result is an award-winning lounge, in which the classic design has stood the test of time and continues to receive positive reviews from Singapore Airlines’ passengers. 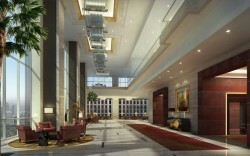 The project consisted of the interior design of the hotel’s presidential suites, suites, standard bedrooms, ballroom, all public areas including the main lobby and welcome lobby, pool and spa. 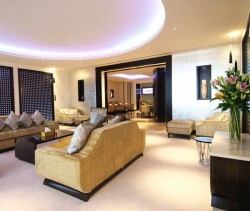 JPA also designed the interiors for the 2-bedroom and 3-bedroom showflats for the St Regis apartments.